Architect's models of the office buildings and one view of glass detail on the finished building. 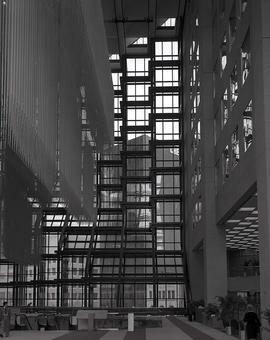 Interiors of the Bell office building and a sculpture. 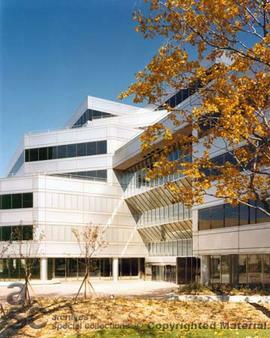 Photographs of the interior and exterior of an office building and attached factory located in Scarborough, primarily the office portion with a curtain wall and exposed exterior columns. Exterior views of an office and apartment building. 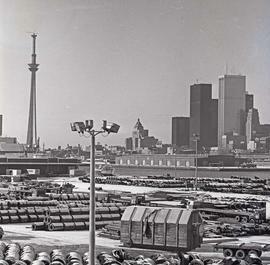 External photographs of the Ontario Hydro building. 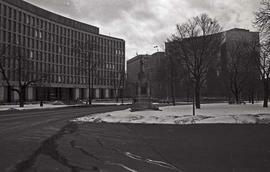 Internal and external photographs of the Ontario Hydro building. 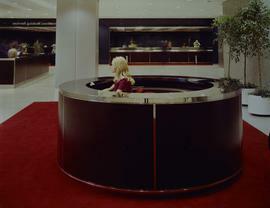 Interior and exterior views of the Ontario Hydro head office in Toronto. Interior views of an office building with bank. Interior and exterior views of an office buiding, including waiting room and view from a window. 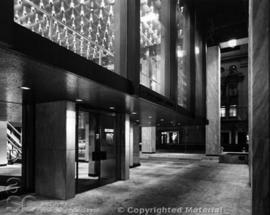 Photographs of the interior of Commerce Court, Toronto, Ontario. 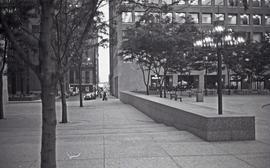 Photographs of the interior and exterior of the Commerce Court, Toronto, Ontario. Exterior and interior views of the Gooderham Building, Toronto. 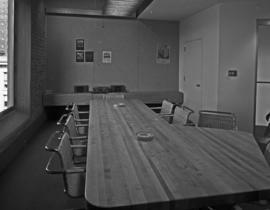 Interior views of a boardroom with long table and chairs. 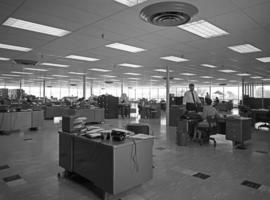 Interior views of an office building with people working. Exterior view of a 3 storey office building, from the side, showing white infill panels on a curtain wall. 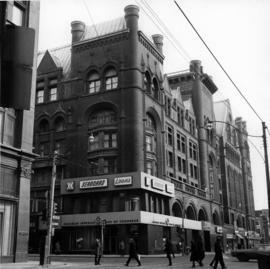 Photograph of the exterior of a three storey office building located at 1883 Yonge Street in Toronto. 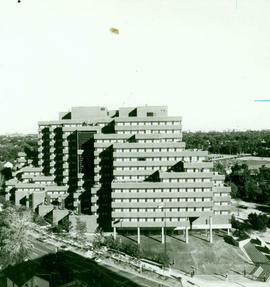 An article on the building was published in the December 1970 issue of Canadian Architect magazine. Exterior views of the office and reasearch building. One interior view of a lounge area. Office and shopping complex located at 99 Yorkville Avenue. Office space designed by Webb, Zerafa, Menkes, Housden partnership for their own use. Published in the May 1974 issue of Canadian Architect magazine. 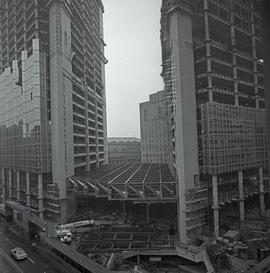 Interior and exterior views of a high-rise office tower and lower-level shopping concourse, designed in glass and concrete. One view of courtyard outside the building. Shopping area shows a Mappins retail store and a telephone booth. Architect's model of a 6 storey office building, designed in pre-cast concrete with blue-metal panelling and stainless steel banding details. 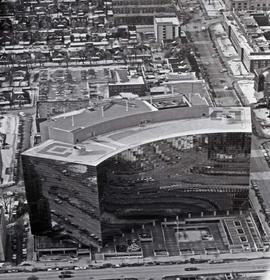 Exterior and aerial views of an office and retail building. One illustration of interior design. Construction lasted from 1981-1985. Head Office, Dow Corning Silicones, Ltd. Exterior view of a staircase to an entrance. 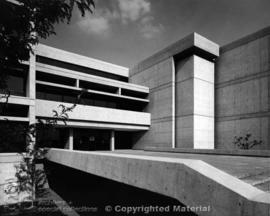 Exterior view of the three storey concrete building, with parkade on rooftop. Additional storage unit clad in metal siding, added in 1983. Artist's illustration of the addition to Manulife's head offices at Bloor and Jarvis Streets in Toronto. 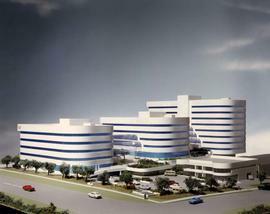 Artist's illustration of a mid-rise office building, constructed to attach to an adjacent office tower. Owned by Maplebrook Properties Ltd. Exterior view of glass clad office building. 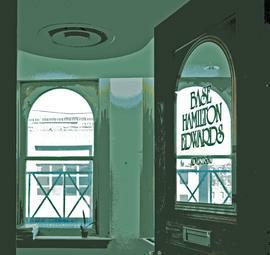 Photograph of the main entrance to the brick office building at 170 Merton Street in Toronto. 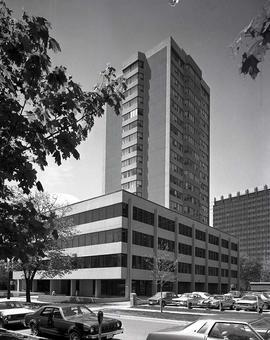 The building was donated in 1969 by the W. Garfield Weston Foundation in memory of Mrs. Garfield Weston, a V.H.A. client. Two renovated Victorian homes turned into office space in Toronto's Yorkville neighbourhood. 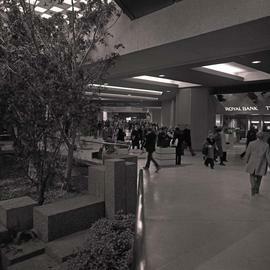 Interior photographs showing offices, waiting areas, hallways, bathrooms, stairwells, and pedestrian underground shopping concourse. Aerial views of modular high rise building. One interior view of atrium/ seating space. 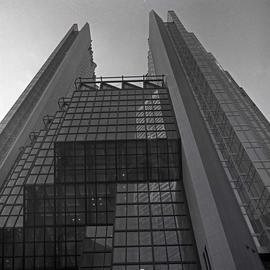 Exterior view of main entrance to concrete and glass office building, located at 75 Dufflaw Road in Toronto. 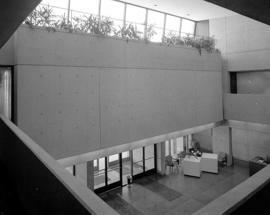 Two exterior views, showing East and North sides of building, and two interior views of a reception area on the 4th floor and a board room. 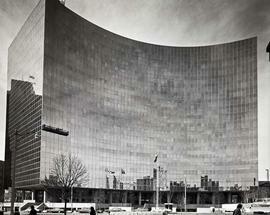 Exterior views of curved glass high rise building. Also known as Ontario Hydro Building or Hydro Place. 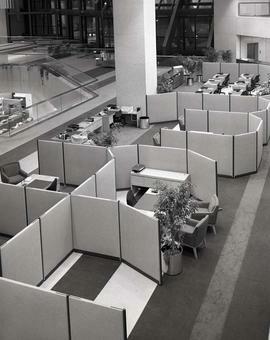 Interior views of hallways, offices and waiting areas with curved walls and exposed piping. Three-storey brick exterior. Exterior views of low rise brick building in landscape. Two interior views of patient waiting areas. Exterior views of the multi-coloured brick office building. Photograph of a long, two-storey office building with a white clapboard exterior, established as temporary offices for the Canadian war effort. A piece of paper adhered to the verso describes this structure as "Temporary Building No. 1". 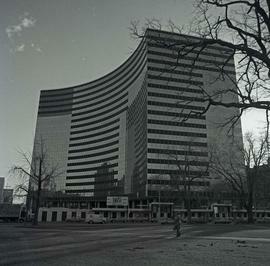 Built in 1970, renovated 1994. 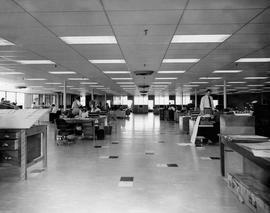 Interior views of the office space, cubicles and hallways and one exterior view of the building from across the highway exit ramp. 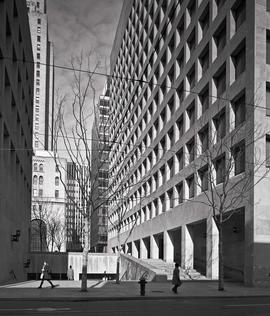 Exterior view of landscaped yard and side of building with overhanging concrete floors. On view through window of studio space at night, showing drafting tables and chairs. 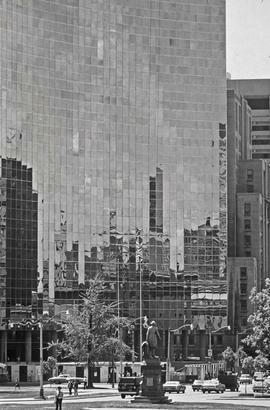 Glass and steel office building located at 207 Weston Road. 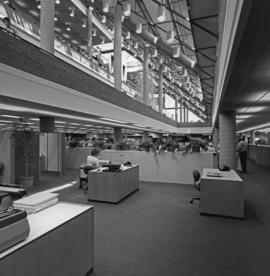 Interior views of the architects' offices, showing staff at work. Interior views of the hallway and decorative glass cube wall feature. 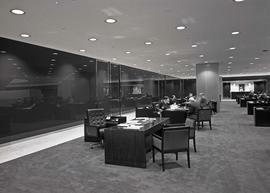 Interior views of a lobby and office space, meeting rooms, featuring glass walls, banquette seating and wood-panneled ceiling. Architect's model of the glass and steel office buildings. 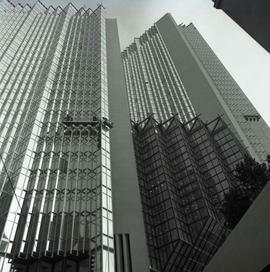 Photographs of a design for an office tower with stepped garden roof and a bank branch on the main level. 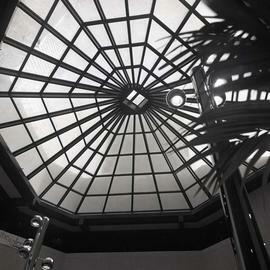 Photographs of the Wellington Square tower located at 26 Wellington Street East, a high-rise glass and concrete office building. Interior views of red carpeted office hallways, meeting rooms and reception areas. 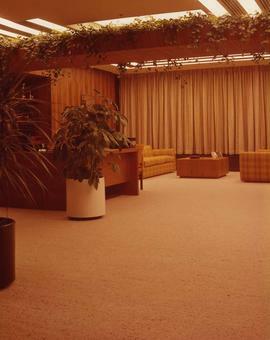 Interior views of an unidentified travel agency office, showing hallyways, reception areas and offices. Example of a renovation of a linear space. Some glazed walls and brightly painted trim. 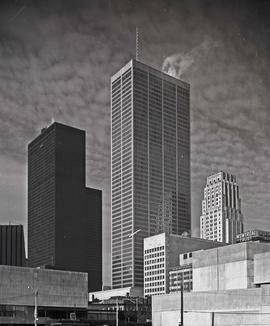 Photograph of a model of the World Trade Centre office towers located at the corner of Queen's Quay and Yonge Street in Toronto. 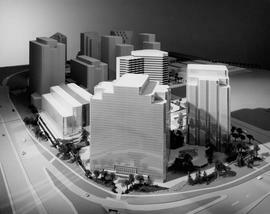 Photograph of a design concept drawing for an office tower located at 121 King Street West in Toronto. The artist's signature is visible on the lower left corner: Connelly Sept 1985. 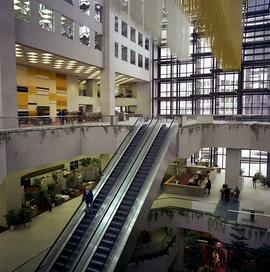 Interior views of reception area and office space in a modern building. Walls of glass blocks to separate hall and office spaces. 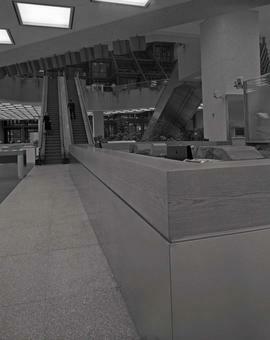 Interior views, reception and work areas. Lattice fencing featurins prominently in the design, as well as corrugated aluminium siding.